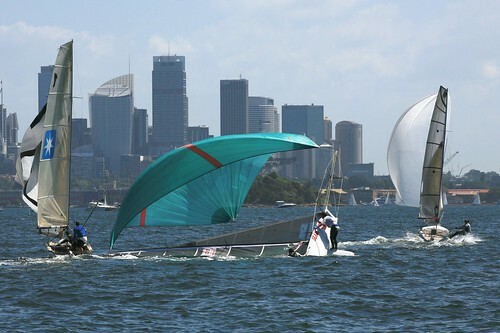 Gemmell Sails are the 2012 Variety Port Jackson Sprint Champions after an exhilarating day of actioned packed racing on Sydney Harbour. Gemmell Sails (Murray Press & Ben Gemmell) started the day with high hopes for their new big rig, an investment that did not disappoint winning 3 of the 4 short races. 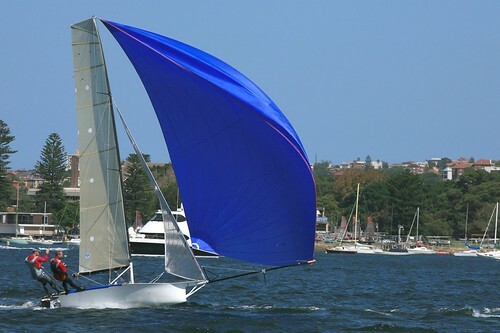 Their speed and experience in the shifty big sail East North East breeze was enough to beat consistent performer Garde (Brett Hobson & Alex Johnson) who had 1 win and 3 podiums. Race one was not a clean start with Variety (Adam Forbes & Richie Johns) a tad too keen jumping the gun by 1 second, having to return and restart. All other skiff got away cleanly, with Gemmell Sails looking the goods straight off the start line, building a solid lead up the first work. 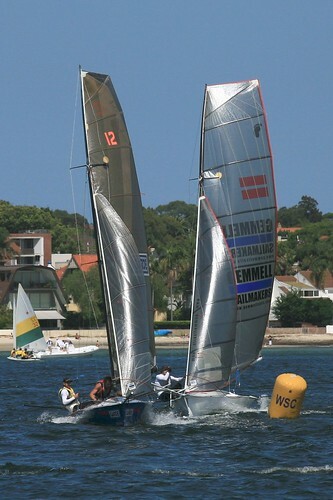 Their top mark rounding was one of only a few blemishes on an otherwise faultless day as they let Garde sneak ahead. Garde extended her lead down the kite run, and left Gemmell to fend off Lincoln Crowne and Geotherm. 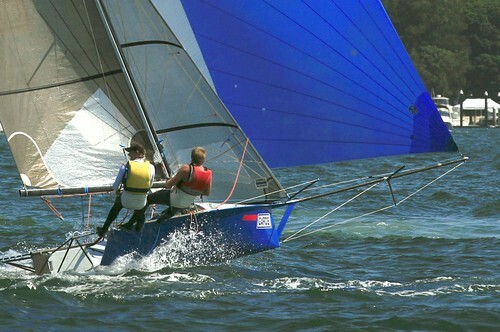 Gemmell Sails displayed true speed up the next work, reeling Garde in before blasting past them on the final run This was a great come from behind win separating the two by a few seconds. Lincoln Crowne picking up 3rd and Geotherm 4th. This set the scene for the next race. In race two Gemmell Sails had another flawless start and first work, leading at the first mark, this time with no mistake in their rounding. They were untouchable in this race and went on to record another win. The minor placing’s were again close, with LCC coming home 2nd, Garde 3rd and Variety in 4th. There were some changes in the order of things for race three, just to keep it interesting. 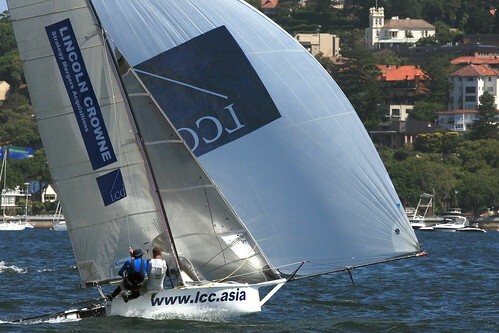 Garde snuck around the first mark just ahead of the chasing pack They defended their position gallantly just managing to hang on to first place from a final downwind run challenge from Vantage Real Estate (Jack Winning and Brett Phillips). Vantage had a stellar race to score a 2nd place. Gemmell finished 3rd keeping them at the top of the leader board and needing a solid result in the final race to stay there, Lincoln Crowne finished 4th. 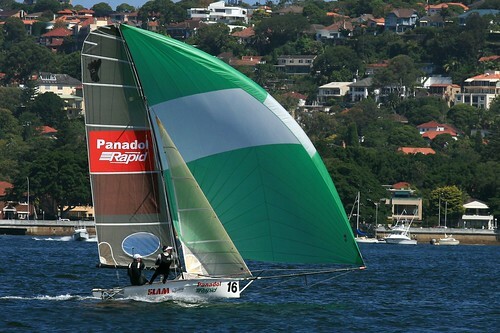 Going into the fourth and final race, Gemmell Sails only needed to beat Garde to take out the Inaugural Variety Port Jackson Championship. Right from the start they were focused and looking strong. They continued to do all the right things, once again leading at the first mark with Garde buried back in the pack. Lincoln Crowne were looking comfortable in second place with Pennyliss (Will Oxby & Ian Goodman) in third. Garde made a charge on the last lap, but were too late to catch Gemmell Sails, they instead picked up another 2nd place, Lincoln Crowne hanging onto 3rd, and Pennyliss having a great race coming home 4th. 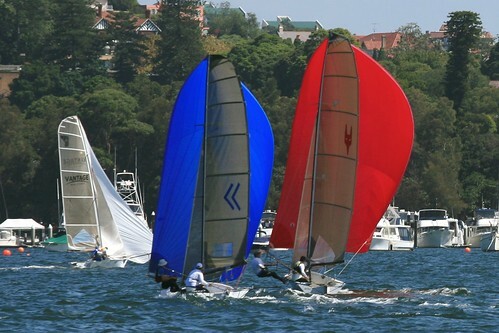 Final podium results for the day were first Gemmell Sails, Second Grade and third Lincoln Crowne. Handicap podium results were first Vantage Real Estate, Second Penny Liss and third Variety. 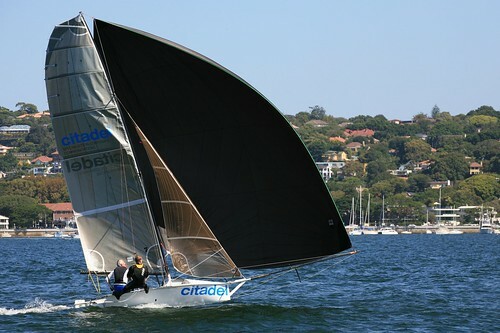 A sensational day was had by all fifteen skiffs and crew, enjoying the seemingly rare sunshine that beamed down on Sydney harbour. 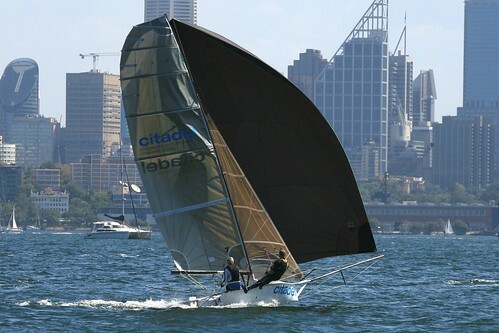 The actioned packed short race format of the Variety Port Jackson Championship was unanimously deemed a stunning success by all competitors, who were excited by the tight racing on the harbour and delighted to be doing it whilst raising the awareness of Alopecia Areata. 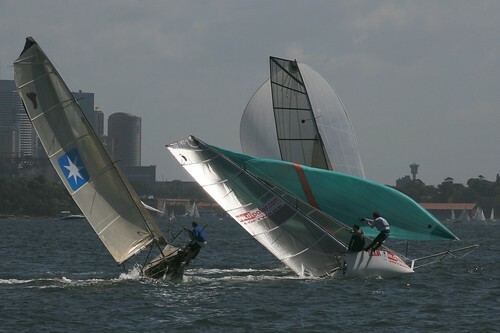 This entry was posted in Race Reports and tagged Woollahra on March 11, 2012 by Karmen.